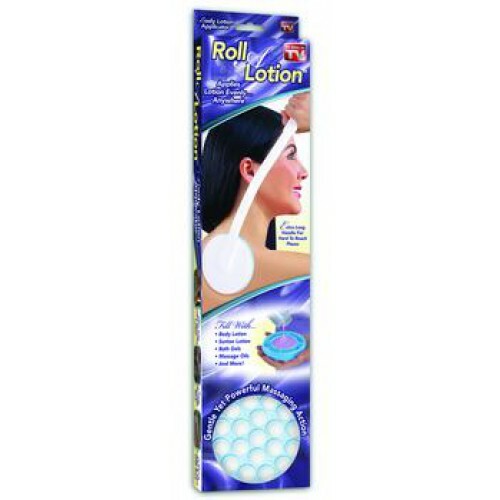 The Roll-A-Lotion Applicator allows you to apply lotion smoothly and evenly with a gentle yet powerful massaging action, all by yourself.. The extra long handle is perfect for hard to reach places when your just cant reach. The Roll-A-Lotion Back Wand has been precision designed to glide over the skin and release an even layer of lotion while it's 19 roller applicators give you a deep massage. When finished, place the air tight cover over the heads to keep the solution from drying out. Treat your body to the luxurious Roll-A-Lotion today.